A group of dancers swarm the stage, their necks thrusting left to right, their hips gliding in the other direction as the chimes of the gamelan ring out. In Ubud, Bali, every night is garnished with traditional dance shows. The performances are intended to enchant both the gods they celebrate and the tourists that come here to escape the buffet lines closer to the beach. Just inland toward the mountains, past the world-famous beaches and resorts, Ubud is a cultural hub showcasing the diverse facets of Balinese culture. On the steps of the many temples, boutiques, restaurants, and cafes, locals rest offerings of rice and flowers (canang sari) in mini leaf baskets three times a day. These Balinese Hindu traditions are gifts to the gods showing gratitude for the richness of life here and evidence to outsiders of the locals’ adherence to tradition. 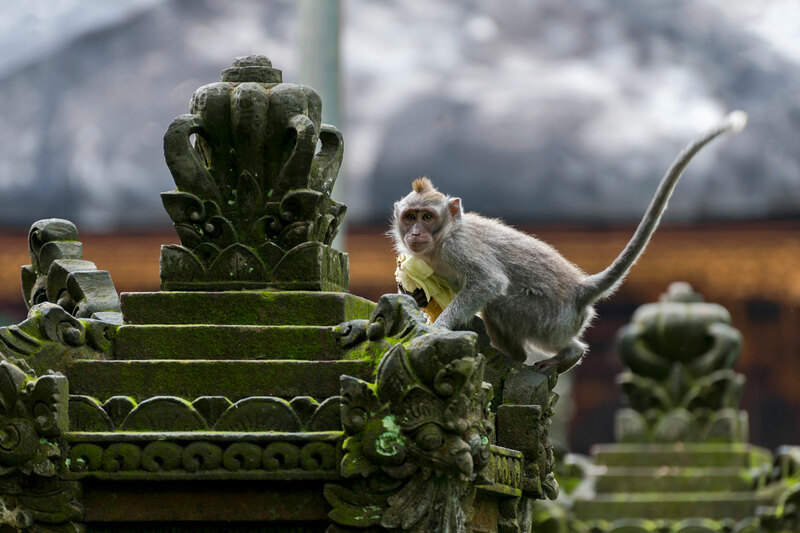 The town lounges along two shopping roads, Jalan Monkey Forest and Jalan Hanoman, both of which are lined with friendly homestays—mostly smallish estates where extended families live together among statues of gods and gardens. We opted for Jangkrik Homestay, a great deal at $15/night. Across the road from Jangkrik is a stage where family members perform a Kecak trance dance (instead of instruments, a group of a hundred men chant as dancers perform) with other people in the community. It’s about $14 a show and proceeds go to the upkeep of the neighborhood. Just down Jalan Monkey Forest is The Sacred Monkey Forest Sanctuary. For $2, visitors can tour temples and an art museum while mingling with apes that are rather less concerned about the intrusion than the sanctuary’s name might suggest. After monkeys steal their food, travelers can head to Sukuma Road, where restaurants serve up Indonesian classics made extra spicy. Whether it’s an introduction or a long stay, Ubud hosts an array of classes and shows to keep any visitor occupied and inspired. More Information: Downtown Ubud is roughly an hour drive north from Denpasar and Ngurah Rai International Airport along Jalan Batu Balan, which winds through the graceful rice fields around the small town of Lodtunduh.